“Babies are using the same brain mechanisms as adults to access the meaning of words from what is thought to be a mental ‘database’ of meanings, a database which is continually being updated right into adulthood,” said Travis. Brain activity indicated that the infants were capable of detecting the mismatch between a word and a picture, as shown by the amplitude of brain activity. The “mismatched,” or incongruous, words evoked a characteristic brain response located in the same left frontotemporal areas known to process word meaning in the adult brain. The tests were repeated in adults to confirm that the same incongruous picture/word combinations presented to babies would evoke larger responses in left frontotemporal areas. 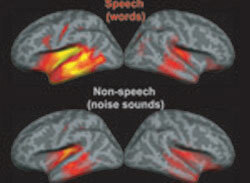 “Our study shows that the neural machinery used by adults to understand words is already functional when words are first being learned,” said Halgren, “This basic process seems to embody the process whereby words are understood, as well as the context for learning new words.” The researchers say their results have implications for future studies, for example development of diagnostic tests based on brain imaging which could indicate whether a baby has healthy word understanding even before speaking, enabling early screening for language disabilities or autism.